St. Patrick´s Day celebrates the rich Irish culture! On Saturday, the streets went green and wild with people celebrating, drinking and eating together! 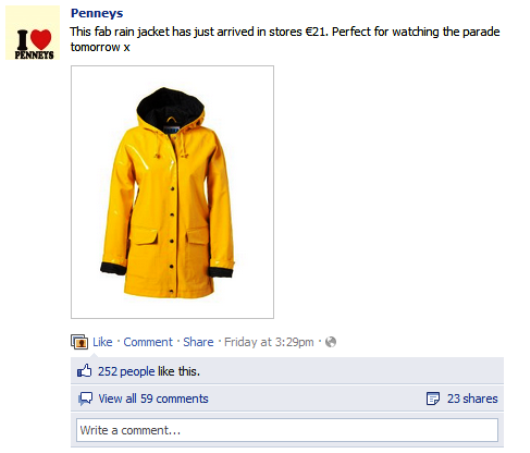 Did the Irish Brands take advantage of this holiday´s social media potential? When looking at Socialbakers statistics for Ireland, it´s Top 5 Brands include Baileys, Blackberry UK & Ireland, Jameson Irish Whiskey, Guiness Ireland and Penneys. Let´s have a look at those that took advantage of St. Patrick´s Day! Baileys Is Proud To Be Irish! The Baileys US Facebook Page launched an application called Kiss Me, I´m Irish to celebrate that Baileys is an Irish drink. It asked its Fans to send their friends a Kiss Me I´m Irish customized photo to win a free Baileys t-shirt! It engaged Fans all over the world by saying: "Share your love for Baileys Original Irish Cream, because we´re all a little Irish on St. Patrick´s Day!" 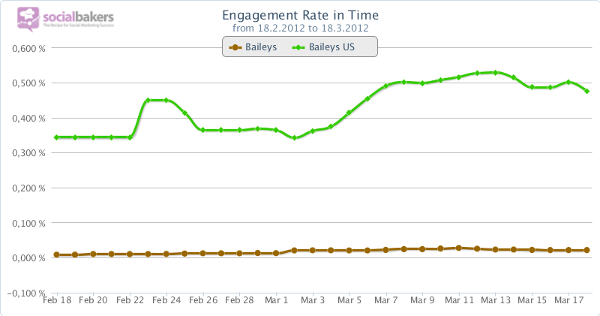 It seems that the US Facebook Page has been more active than the global Baileys Page. Even Socialbakers Analytics prove that although the US Facebook Page has a smaller Fan base, it has been engaging more with Fans. The Jameson Irish Whiskey decided to hold a huge party taking advantage of several social media platforms. The Jameson Facebook Page launched the Slainte-o-meter motivating Fans to make an authentic Irish toast and spread the word to make them attend the Jameson party in their city or to watch the best of the Jameson Global Party 2012 on YouTube, tune into one of the 35 radio stations from 11 countries broadcasting from the Old Jameson Distillery and to make Fans share the festive atmosphere via Twitter. The official website has also prepared a St. Patrick´s Day Guide including party decorations, cocktail recipes, party banners and even a guide to Irish slang! 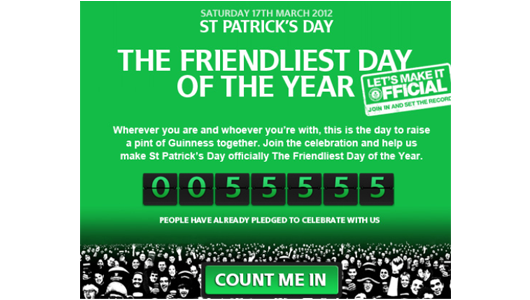 The Guinness Ireland Facebook Page launched a global online campaign to achieve the Guinness World Record for the "Largest St. Patrick´s Day Celebration” making it officially the "Friendliest Day of the Year. After joining the true Irish friendliness, the Fans gained access to an animated interactive infographic packed with interesting facts. Did you know that about 13 million pints of Guinness beer are consumed on St. Patrick´s Day every year? I bet you didn´t know that that's enough to fill 60 percent of the Empire State Building! And you probably wouldn´t guess that 1 in 161 Americans is named Patrick! But you should be mainly surprised by the fact that Guinness Fans could share each factoid on Twitter, Facebook, Google+ or email! The Primark fashion retailer in Ireland decided to make the Penneys Facebook Page more about Mothers Day celebrated on the following day. It celebrated St. Patrick´s Day simply by posting: "Happy St. Patrick’s Day to all of you!" and by recommending a fab rain jacket said to be perfect for watching the parade! Currently, there are 2 116 280 Facebook users in Ireland, which makes it #59 in the ranking of the Facebook statistics by country. Feel free to try our professional social media monitoring tool Engagement Analytics – monitor the situation on the market, track and analyze your fans' engagement on your Facebook page, identify key influencers, gain control over your response rate and much more!